Off the shore of Haiti on board the U.S. Hospital Ship USS Comfort….. This is the link for the story with Dr. Gupta of CNN……. 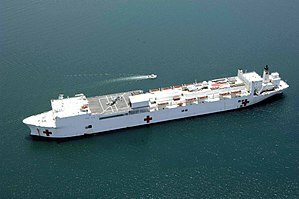 USNS Comfort (T-AH-20) is the third United States Navy ship to bear the name Comfort, and the second Mercy Class Hospital Ship to join the navy fleet. The USNS prefix identifies the Comfort as a non-commissioned ship owned by the U.S. Navy and crewed by civilians. In accordance with the Geneva Conventions, USNS Comfort and her crew do not carry any ordnance and firing upon the Comfort is considered a war crime. Like her sister ship USNS Mercy (T-AH-19), Comfort was built as an oil tanker in 1976 by the National Steel and Shipbuilding Company. Her original name was SS Rose City and she was launched from San Diego, California. Her career as an oil tanker ended when she was delivered to the Navy on December 1, 1987. Now, as a hospital ship, Comfort‘s new duties include providing emergency, on-site care for U.S. combatant forces deployed in war or other operations. Operated by the Military Sealift Command, Comfort provides rapid, flexible, and mobile medical and surgical services to support Marine Corps Air/Ground Task Forces deployed ashore, Army and Air Force units deployed ashore, and naval amphibious task forces and battle forces afloat. Secondarily, she provides mobile surgical hospital service for use by appropriate US Government agencies in disaster or humanitarian relief or limited humanitarian care incident to these missions or peacetime military operations. Comfort is more advanced than a field hospital but less capable than a traditional hospital on land. When not actively deployed, Comfort is kept in a state of reduced operations in Baltimore harbor. She has been used many times over the years and has been ready to ship out of Baltimore with 5 days’ notice. 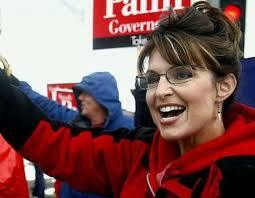 Sarah Palin…….What does she want to be? — Republican strategist Alex Castellanos, quoted by the Washington Post. 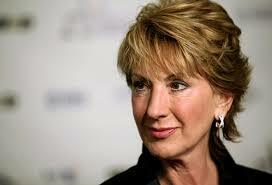 Humm?……And that’s from a Republican talking head ? Hollywood studios, juiced by the success of “Avatar,” are tripping over each other to release movies in 3-D. In the process, they risk overloading multiplexes, which are equipped to handle only a portion of the 3-D pack at a time. More than 20 3-D releases are scheduled already for this year, and additional titles are expected to be announced. Costly productions could wind up cannibalizing each other as they jostle for screens. As of the beginning of the year, less than 10% of the U.S.’s roughly 40,000 screens were 3-D enabled, according to the National Association of Theatre Owners. Early next month, Walt Disney Co.’s “Alice in Wonderland” will hit theaters at a time when “Avatar” is still running and hoping to capitalize on the Academy Awards, where it was nominated in nine categories. Some theater owners worry they will not have enough screens to play both films. “Avatar” has grossed $2.4 billion so far. More serious traffic jams follow. In early April, Warner Bros.’ “Clash of the Titans,” which is undergoing an 11th-hour conversion into 3-D, is set to open just a week after DreamWorks Animation SKG Inc.’s “How to Train Your Dragon.” Some 3-D screens will still belong to Disney’s “Alice” at that time. Some exhibitors say they even got the impression from Warner Bros. that the studio was prepared to withhold its other films from theaters that wouldn’t agree to make way for “Clash,” according to people familiar with the matter. Why being attractive isn't worth it……. Why being attractive isn’t worth it……. Another day another story about Oxedine that should give voters pause. The banks that handled the accounts have been subpoenaed by the State Ethics Commission, but as they are in Alabama, they are refusing to honor the subpoenas. Now the Attorney General will probably get involved and ask a court in Alabama to have the banks honor the subpoena request. This will just keep this story alive to keep clubbing the Ox. I get that Georgia Primary voters know Ox more than most of the other candidates because he’s been kissing their butts since 1994. It’s not them I’m worried about. It’s the non-primary voters who can quickly see through the pandering veneer into what a reckless politician he is. Hopefully primary voters will be smart enough to see the danger and reject Oxendine. The best thing that could happen to the Georgia GOP is to see the end of Oxendine’s political career. Unless a subpoena comes from the same state as the Insurance Companies are in, they don’t have to turn over any information. And I don’t see the problem in Businesses giving money to the PAC’s of their choice. This is just nonsense manufactured by the radical left and neo-cons like Erickson. I am comforted that Georgia Primary voters know Ox more than most of the other candidates because of his selfless public service since 1994. It’s not them I’m worried about. It’s the non-primary voters who can quickly be influenced by Lefties and Neo-Cons that they don’t see what an honorable politician he is. Hopefully, primary voters will be smart enough to see the BS the progressives are manufacturing and vote Oxendine. The best thing that could happen to the Georgia GOP is to see Oxendine’s election to the Governorship.